It is Post Transplant Day 22! It has been 13 days since I last wrote a blog post. What has been going on? On one hand, very little changes have occurred. On the other hand, so many blessings have been manifested and personal lessons have been learned. Ashtyn has been in the hospital for the last 25 days for her bone marrow transplant. Each day seems similar to the day before. Every morning blood is drawn from her central line for labs. For many days results came back showing very little change. Her absolute neutrophil count (ANC) went from zero to 100 on Post Transplant Day 14. The ANC then went up to 200 on Day 15 and remained that way through Day 19. On Day 19 she was given a medication called Neupogen which helps the immature white blood cells mature into neutrophils. On Day 20 she had an ANC of 700 and yesterday her ANC was 1000! July 1st was the offical day of engraftment and we are so grateful. Ashtyn now has sufficient white blood cells to go home to continue her recovery. A few things need to happen before Ashtyn can go home. She needs to be able to take all her medications by mouth instead of IV. Nausea has been a big problem for her the last several weeks. Every two hours the nurses give her one medication or another to help with nausea. She still dry heaves several times a day. Nausea is not unusual for bone marrow transplant patients. It wouldn’t be unusual for Ashtyn to go home on IV nutrition until her stomach is able to tolerate a sufficient amount of food. For now she will try to tolerate pills and eat crackers from time to time. Since nausea is ever present, even the thought or mention of food makes Ashtyn more queasy. “I don’t know how I will ever be able to eat again.” It may be a couple months before Ashtyn is back to eating normally, but she’ll get there. Ashtyn has truly been blessed with a miraculously smooth and straight forward bone marrow transplant. She has remained healthy without infection or complications. It hasn’t been easy. Nothing worthwhile is easy. There have been times where she has cried from feeling so lousy. Her blue plastic barf bag continues to be her constant companion. Leg pain is always a nuisance. Now that her ANC is over 500, she is allowed to walk the halls and even leave the floor, but she doesn’t feel up to it. She has gained close to 12 pounds in fluid and has been given the medication lasix several times to help eliminate excess fluid. She also has been needing oxygen while sleeping, which is likely due to her inactivity and fluid retention. Ashtyn has been isolated in her room. The most exercise she gets is walking 10 feet to the restroom and back. Physical therapy helps her do exercises that strengthen her arms and legs three times a week. 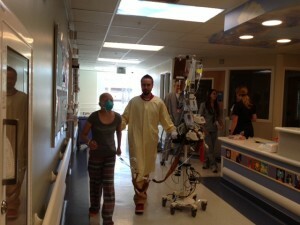 Two days ago, after being in her room 23 days straight, she walked out of her room for the first time. With a lot of leg pain, she walked 30 feet to a window and back. Each day she will build on that. Generally Ashtyn just doesn’t feel well. The only thing I can guess of how it must feel is being in bed with the worst flu imaginable that continues day after day after day. During the bone marrow transplant, she is learning a lot about patience and endurance, trying to stay strong and carry on. Ashtyn has been sleeping a lot the past couple of weeks. The fatigue is a result of low blood cells, medications, and her body’s need for rest as it is working hard to recover. 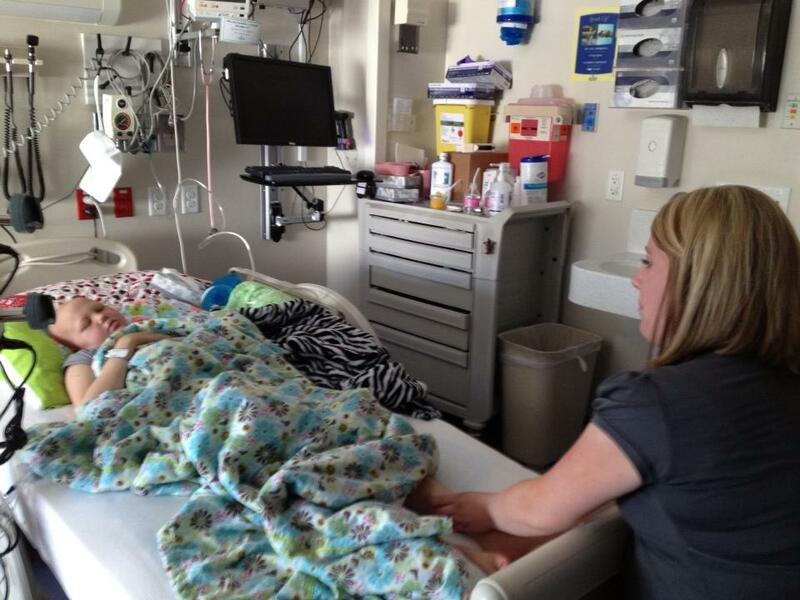 In the past, while Ashtyn has been hospitalized for chemotherapy rounds, every day was busy. It seemed each day brought changes. Some moments her health was stable. Other times her body struggled in different ways and in varying degrees. 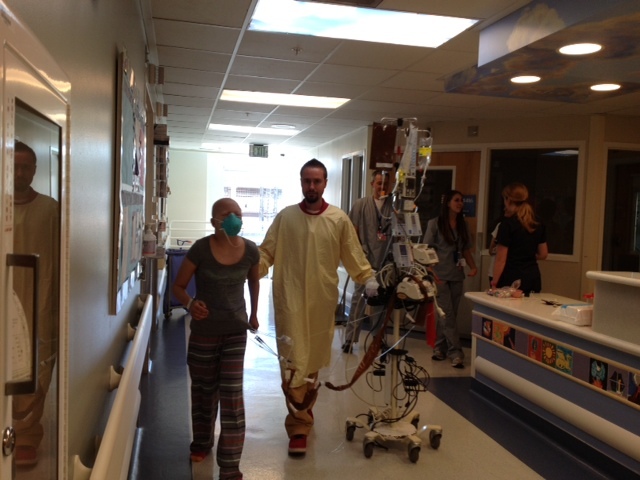 During the bone marrow transplant, Ashtyn has been blessed to be able to rest during most of her days. Since Ashtyn sleeps so much, I have had hours to sit and ponder lessons I have learned from so many of you. Some people have mentioned how inspiring Ashtyn is. I have been told that people admire the way she has faced and dealt with cancer. Several individuals have shared that they look at their own trials differently because of her. If Ashtyn can face cancer with faith, trust, hope, optimism, and patience, then surely they can face their trials the same way. Do you understand that we have learned and been inspired far more by Ashtyn’s Army than they could have ever learned from us? It is interesting how “Ashtyn’s Army” naturally came in full force when she was first diagnosed and it has continued to stay strong. I always knew how much we needed people for prayers and support. I never imagined how personally it would change my life. Not only is my daughter being blessed with health and miracles, we have grown in so many other ways. I can’t possibly explain all I have learned in just one post. I will start with this: From Ashtyn’s Army, I have learned the importance of being involved in others’ lives and allowing many people to be involved in my life. I have learned the importance of balance. What an example Ashtyn’s Army has been in balancing their love, thoughts, attention, prayers, and service. I understand now that it’s not enough just to focus on immediate family. It’s not enough just to focus on church or a career or interests. There must be balance. When I leave the hospital I want to be more like Ashtyn’s Army. I want to not only put my heart and soul into my family, but I want to put heart and soul into my community and friends, into my church and neighbors. If I had a career, I’d put my heart and soul into that as well. Balance. I think I was off balance before. I don’t think I had my eyes open to those around me in need. I don’t think I had my eyes open to those around me that I needed. I don’t think I understood the importance of people in my life or the importance of me being in others’ lives. Every interaction can be important and can have a postitive influence on lives. I’ve learned that Ashtyn’s Army isn’t just about Ashtyn. It’s about all of us. It is about Ashtyn inspiring others and others inspiring her. It is about all of us inspiring and helping each other in what ever struggles we may have. We are all in this together. And it’s not just about cancer, it’s about life. We are all on this earth together for a purpose, for a reason. I stand by what I have said before, every individual matters and contributes to lives in ways no one else can. I need each individual in my life as much as the next because each brings unique gifts and talents that no one else can bring to the table. For an example, I do not have the talent of giving gifts. Ashtyn and I have received the kindest care packages, gifts, and notes. What an example this has been for me. I will forever be more mindful of opportunities I may have to send an encouraging note or a gift to someone in need. For those who have sent Ashtyn gifts in the past five months, please know we have been touched by every single item received. Jenny was a “stranger” before she read Ashtyn’s blog months ago. Because of her involvement, she is now a lifelong friend. She wrote: “Thinking of you guys today!! Can I bring you anything? How are Ashtyn’s feet feeling? I hope they continue to feel better! Please let me know if/what I can do to help! Sending happy vibes your way.” Jenny then got a babysitter for her kids and drove an hour to visit us in the hospital. She brought Ashtyn thoughtful gifts and gave her a foot massage. Is it possible to have too many friends and family? Not a chance. I have learned the importance of involving people in my life. I need them, every one. I have come to really know for myself the importance of people in my life. Each friend and interaction brings something unique. I know my days would be different without the simple interaction of individuals that are placed in my life at the right time. Each person teaches me and adds to my life. From Ashtyn’s silent followers to the most outward, you are all involved and I’m grateful for that. Thank you Ashtyn’s Army for helping Ashtyn and I find joy in our journey and for sharing your love for us. You have changed our lives forever. “Let us relish life as we live it, find joy in the journey, and share our love with friends and family.” President Thomas S. Monson. Suzanne! Engraftment day came! I knew it would. I’m so grateful for the opportunity I had to meet & get to know you. Ashtyn & your family are in our constant prayers & I hope you too will be able to return home soon. Our day finally came after 110 days in the hospital, & we couldn’t be more happy. We love you so much & will always keep in touch. Please let me know if I can do ANYTHING for you! Thank you for sharing this little slice of heaven! I think this is what heaven is like–a whole community of people lifting and building each other. Sealed to each other in a connected web that provides a safety net for whoever needs it. I’m so glad to hear Ashtyn is improving, and I hope her nausea subsides soon and she’s able to get her strength back so she can once again enjoy her childhood! God bless your whole family! I am so happy engraftment day came, but I was hoping that meant that Ashtyn would feel better! I think about you both all of the time. I hope that Ashtyn feels better soon! Suzanne, we should get together for lunch soon!